Before sunrise we left with Thalia from Elati and about 10:30 she left me at the airport El. Venizelos where my friends Teo and John were waiting for me. We were lucky that we didn't have to pay extra money for our overweight luggage. The flight was one our delayed and in Bahrain we had to wait 40 minutes in the plain because there was no parking place for the plain. Razaq was waiting for us at Islamabad's airport. By taxi we went at the Miraj hotel to have breakfast and rest. In the noon and the afternoon we went shopping and had a dinner. The weather in Islamabad was very damp because of the monsoon. Early in the morning we left from the hotel to Islamabad's airport. We had 50 kg overweight luggage and we had to pay extra 2700 Pakistan rupees. Our flight had a delay but the weather in Chitral was good, so we left. Abdulkhaliq was waiting for us at the airport and we spent the night at the Tirich Mir View hotel. Muslims had their bayram and the Mosque was pretty crowded. We went to the police station to get our staying there permission. In the afternoon we went shopping to buy some of the things that we need to have on the mountain. In the evening we had our last weather forecast from internet and dinner at the hotel. Even though we woke up early the jeep was delayed, so we left at 8:10 from Chitral with Abdulkhaliq, his daughter Fatima, one of his friends and all our things. In Buni we stopped to fix our broken car. The road up to the Shagrom village was very bad and it was difficult to get there. Although the view of Buni Zom and Tirich Mir was great. From Shagrom we could see the summits of Kono Zom, Tirich Mir and Raghshur Zom. We did our camp in the camping of the village. We started packing our equipment and luggage for the porters. Every summer villagers go up to Bandok area so it was imposable to find 14 porters to carry our things up to the base camp. We found only 11 and we left our three rucksacks with the climbing equipment to the village. We went ahead and we wait in the Udren Gol the porters. There is a natural bridge of glacier that we turn from right side of the river to left side. The slopes are very steep and there were no path. Porters create steps with their axes. After the path was better and area more flat up to Shong-o-Lasht (3200m), where we did a long stop. 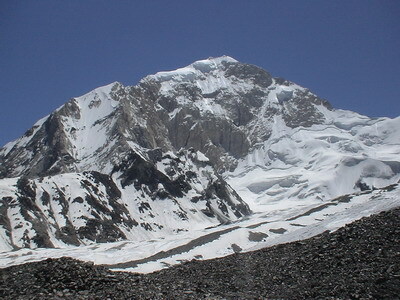 We continue higher towards to Lopar Gol where there is the conflux of the steams Lopar and Raghshur. It was not able to cross Raghshur stream and we had to climb a difficult rock wall about 100 meters high up to II UIAA difficulties using rope because it was very difficult for the porters to climb with their loads. We continue higher into the steep grass fields but it was to late (17:30). We stop leave our luggage (3580m) and we when lower into the area call "jungle" (3500m), due to the bushy forest. Here there is spring water, Abdulkhaliq cook and we sleep on the big rocks. Tsapati and tea was our fast breakfast early in the morning. We continue traversing the rocky part from the right side. Higher we met a steep losing field about 30 meters where we make holds with the traditional piolets. Track was very difficult, and we try to find a route that will leads to the glacier. We continue traversing until we reach a stream with drinkable water. After crossing the stream we direct climb high following the small ridge. We reach the altitude of 4200m and the route was really very difficult. Teo, Giannis, me and Ronchiro choose the direct way when porters traverse a few meters to the left. After an hour we reach met all together almost on the glacier. The view from Raghshur was great and the huge glacier just in front of us. 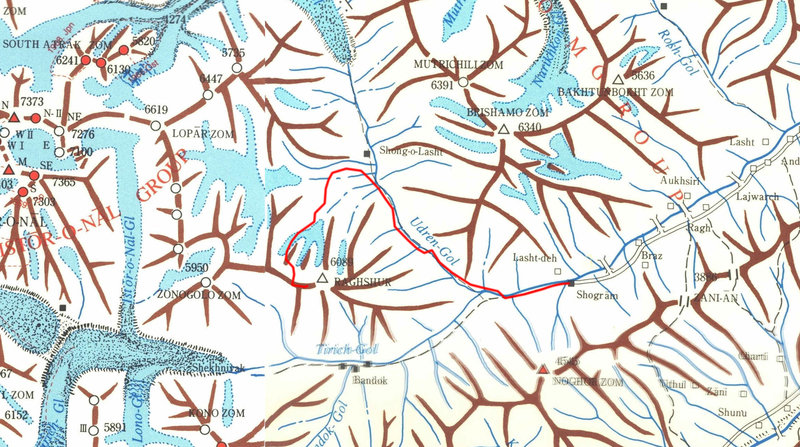 Abdulkhaliq knows a flat place 20 meters from the ice of the glacier where run water. Here we start to make our Base Camp (BC). Porters was paid by Abdulkhaliq and left running back to Shagrom. We work for many hours to create flat places for our tents. Base camp was on 4430 meters altitude and has 3 sleeping tents and one kitchen tent. Due to high altitude I had headache and I had a very bad sleep. Temperature at night was below zero. We had late a breakfast (9:15) and we prepare out equipment for higher. Our target was to move the equipments higher and also to get acclimatized with the high altitude. Glacier was quite flat and without many crevasses. After two hours trekking we reach the highest point of the glacier that can see rocks and we left out equipment. Here we make plan for our route to the west ridge. Abdulkhaliq prepare lunch, when we return back to BC. Today we were waiting the three porters to bring our rest equipment from Shagrom. We suppose that they will be in the morning but finally they reach BC at 15:00, carrying 75 Kg of climbing equipments. Porters reach BC from another route and they believe that was easier that the first one that we climb. Without to lose time, we toke our equipments and at 17:00 we climb up to the glacier on the immediate stop, where we had our rest equipments, left form yesterday. We place a tent and we overnight. We wake up at 5:00 and we start our climbing at 6:15 with full equipment and roped together to cross the glacier. We cross the huge crevasses without problem and climb the long ramp (20-30 degrees). At 9:30 we reach the huge bergschrund. Here we begin to climb with pitches where the first one was 75 meters combining the ropes together, where Teo found a ice part for belay. Teo continue leading while me and Giannis following using jumar Next pitch was in almost 60 degrees ice for 30 meters and almost same with the third one pitch. The last one was 90 meters long because Teo needs to find a flat place in the soft snow to belay near the ridge. This pitch was in fresh snow 50 degrees but very dangerous due to none anchor climb and to unstable snow. Finally, at 17:00 we reach the col in the west ridge of Raghshur at 5530 meters. We find a very good place for camp, where a few meters lower runs clean water at the afternoons. Giannis was very bad due to altitude and it toke us a lot of time to make the camp and cook. Weather was perfect and sunny, while the temperature inside the tent was -3C. Night was silent, but all of us has headache due to altitude. At 6:30 we wake up and have breakfast. We roped together and a few meters lower Teo makes a belay. From here we make a rappel 55 meters and we reach one of the old belays. Second rappel was 35 meters while the third one was 60 meters, just on the limit of the ropes. The fourth rappel ends into the huge crevasse. In total less than two hours we need to rappel the slop. We continue the ramp roped together until the intermediate stop in the bottom (4775m). We leave part of our stuff, we take a rest and continue to BC where we reach it at 12:30. Giannis was filling very bad while Teo was much better. I was filling quite good and no too tired. Today Abdulkhaliq butchered Ronchiro. He started cooking lunch very early in the morning. The weather was not very good, so I woke up frozen. It was a relaxing day at the base camp. The food was very good and we did our plans for the final ascent. We prepared the food and our equipment for the next camp. We got the weather forecast; we were feeling better, so everything was ready. At was night when Abdulkhaliq wake up us. We had breakfast and at 4:10 we left for the camp. We reach the ramp very soon and we climb for the send time the icy slopes to the col in west ridge. This time we did 4 pitches using the same technique as the first time. Some belays needs had problem and we make them again. I was exhausted when I reach the col (15:00) due to long too but mostly due to hot and sunny day. We had dinner and we rest, a cold night came with -4C inside the tent. 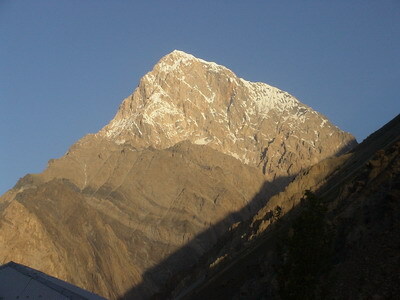 In the morning we prepare to climb higher and to explore the area, in order to find a route to the summit. West ridge starts with 50 degrees ice and continue with an exposed rocky part. After about one hour we reach the bottom of the rocky towers (5630m). This was the highest point of the Italians in 1974. First, we try to traverse for the right side (south) but was not possible due to long vertical rocks of the towers. Such, Teo starts traversing from the left (north) the mixed snow/rock slopes. After one long pitch Teo realize that this was the most viable route to continue, and return back. Weather was prefect all the days that we were on one high camp. At 7:00 we start will all equipment, to climb the ridge towards the rock towers (8:20). We made the first pitch, traverse from the left (north). After the second pitch we attempt the couloir after the rock towers. Teo leads and the third pitch, climbing the couloir, which has no good snow conditions. In the end of the pitch about 50 meters, Teo face the huge cornice of the ridge, impossible to climb it. We decide that we can not continue and we return back to our camp. We had realized that we are not able to continue from the previous day. At the afternoon I follow the ridge to west until the summit P 5578 meters, this peak is western than the camp on the west ridge. From here I have panoramic view for the mountains of Hindukush. In the rocks just on the camp we left a yellow plastic bottle, where we have a message with details for our detail attempt and contact info, in order to give help to the next climbers. Alarm rings at 6 in the morning, at 7 we start to descent. Belay was destroyed for the hot days, and Teo make new. We rappel from abalakov holes, I was the last one, Teo (the heavier one) was checking first that it was strong, with backup an ice screw. In two hours we have reach the bottom of the steep slop. We fast cross the glacier and descent from the ramp. In few hours we reach the intermediate stop, where there were and our rest equipment. Here we had an hour stop and we load in our backpacks all the equipment from there. Our load was very big, but in order to avoid one more climb here, we carry everything now. Even the route was no difficult, we were quite tired, everything ends at 12:00 in base camp. Abdulkhaliq was not in Base Camp. He has went to Shagrom village the days that we were on the high camp. At 15:00 Abdulkhaliq arrive in BC and we had dinner all together. This was a rest day in BC. We have time to pack our equipment and prepare everything for our departure. Porters arrive in BC at 12:00 and at 13:45 we start to descent all together to the village. The descent was quite difficult and long. Route was different than from ascent and we cross Raghshur stream from an ice (glacier) natural bridge. Late in the afternoon we reach Shong-o-Lasht and continue lower. Finally, at 17:30 we reach an place called Manitso-Kurang 3170m where there is a very nice view to two waterfalls. We bivouac near the river with the porters. Before the sunrise, we had breakfast and at 7:30 begin the trekking. Shagrom village was not far, nut weather was very hot. At 10:30 we reach Shagrom and we rest in the camping. Teo divide an old climbing rope and gift it the porters while we sell the static rope. We had reach lunch in the house of Abdulkhaliq and we rest in his guest house. At the afternoon Razaq guide un tin the village. At the morning we depart with the jeep from Shagrom and at noon we arrive in Chitral. We rest in Tirich Mir view hotel and we had a shower after many days. In the afternoon I met Professor Karig Baig in tourist information office. By car we went from Ayun to Brun of Bumburet. Then we went to Kalashadur where we met Thanasis, Maria, Liana and Christina. We talked and had lunch together. In the afternoon we walked up to Batrik village and we returned at night in Kalashadur, where we spend the night. Early in the morning we took the first jeep to Chitral. Shopping, internet and rest in the hotel. I spend my day at the tourist information with Professor Karig Baig. Our flight to Islamabad was cancelled so we decided to go by car. In the evening Razaqs family prepared dinner for us in his house 10 km south of Chitral. The mini bus Toyota Hiace arrives in the hotel at 8:30. We load our luggage and we pass from the police to define our departure. The road to Islamabad crosses the trouble areas of Taliban. Mini bus has two drivers, but before Lowari pass gear box stacked in 1st gear. It was unable to change gear and we cross Lowari pass with the 1st gear. Just before Dir gear box starts to work again. We stop for service but they make nothing and continue. A few kilometers after Upper Dir, gear box was completely destroyed. We stop in a gas station without to know who we will continue to Islamabad. One of the drivers went to Dir and came back with a workman to repair the car. Finally after an hour of work, car was ready to drive to the capital. One screw has been missed and placed a new one. At 18:30 we cross Madren Pass which is closing at the night fro security reasons. Road had many check points and blocks from the police and the army. Many times they check our luggage but when they realize that we where foreigners they let us to continue. Generally, the road form Dir to the capital was very good and flat due to constructions. Near Mardar city we follow Μ1 highway and at 22:00 we arrive in Islamabad, and we overnight in Miraj Hotel. At the hotel, we had a relaxing day. Early in the afternoon we went for a walk and we arrange the taxi that would take as to the airport. At 4:00 we took two taxis from the hotel to the airport. We were stopped by a police block. They were asking for special documents that we needn't to have. Finally they asked 500$ to let us go. We denied, we gave them 1000 rupees and we were on time at the airport. In the afternoon we were in Athens, after a short stop in Bahrain. Thalia was waiting for me and together we drove back to Elati.